A family of niine were rescued from Gunflint Lake about noon Saturday after their boat capsized in heavy swells. 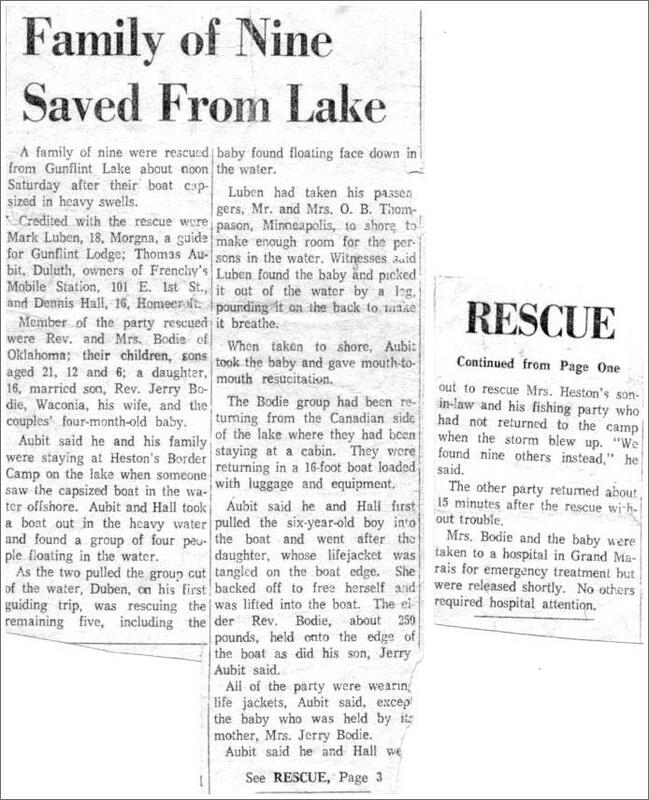 Credited with the rescue were Mark Luben, 18, Morgna, a guide for Gunflint Lodge; Thomas Aubit, Duluth, owners of Frenchy's Mobile Station, 101 E. 1st st., and Dennis Hall, 16, Homecroft. Member of the part rescued were Rev. and Mrs. Bodie of Oklahoma; their children, sons aged 21, 12 and 6; a daughter, 16, married son, Rev. Jerry Bodle, Waconia, his wife, and the couples' four -month-old baby.